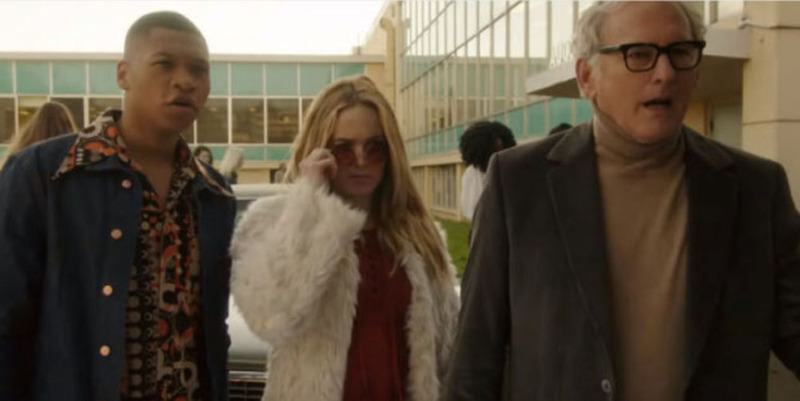 Part Two of the Legends of Tomorrow pilot kicks off as the legends head for Norway where various terrorist groups are meeting to buy weapons at a black market gathering. Gideon, the computer of the Wave Rider, has determined this is where Vandal Savage can be found. Snart elects himself as the leader of this mission to infiltrate this sinister swap meet, along with Rory, Sara and Professor Stein. When stolen credentials arouse the suspicion of one of the guards, Stein improvises and begins rattling off various terrorists’ attacks that his group, Scimitar, has been behind. The act works and the guard lets the group in (and Rory profess a new found respect for Stein’s brand of crazy). Once inside, the team is surprised to learn that Savage is not here as a buyer, but a seller. He has a nuclear warhead that he is auctioning off and he is also sensing that his old foes, Hawkman and Hawkgirl, are nearby. Stein sees Savage giving them the once over and he orders Rory to bid on the warhead. 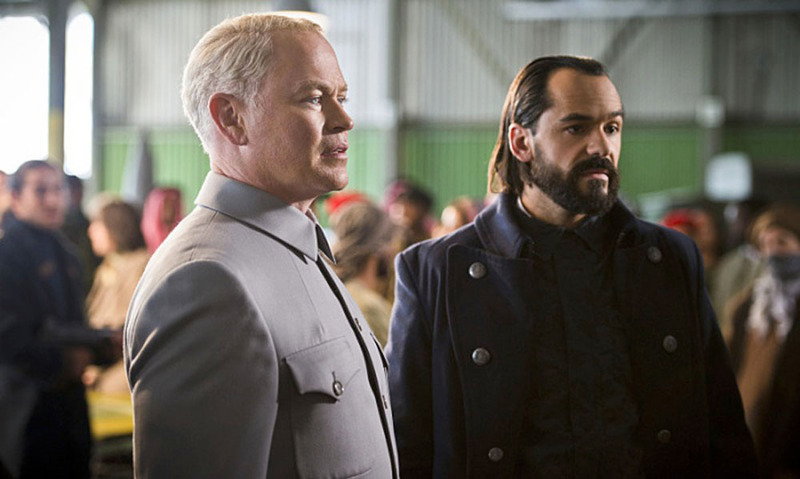 Unfortunately, the legends win this auction and raise the ire of one other potential customer, Damien Darhk (Neal McDonough), who looks as young in 1975 as he does in 2016 on Arrow. Darhk confronts Stein and the others, telling them that he doesn’t know this group, and in this circle, he knows everyone. Savage steps in to demand payment for his warhead and Stein makes a huge mistake by trying to BS Savage about examining the warhead first and doubting that the immortal could have obtained enough fissionable material “in this era.” Savage knows he is dealing with someone not from this time period and he offers to sell the warhead at a discount to the group that brings him the head of Stein and the others. Jefferson, sensing the jig is up, sends in the Hawks and the Atom, who has been hiding in Stein’s jacket, springs into action. When Savage is confronted by Carter and Kendra, he arms the warhead. 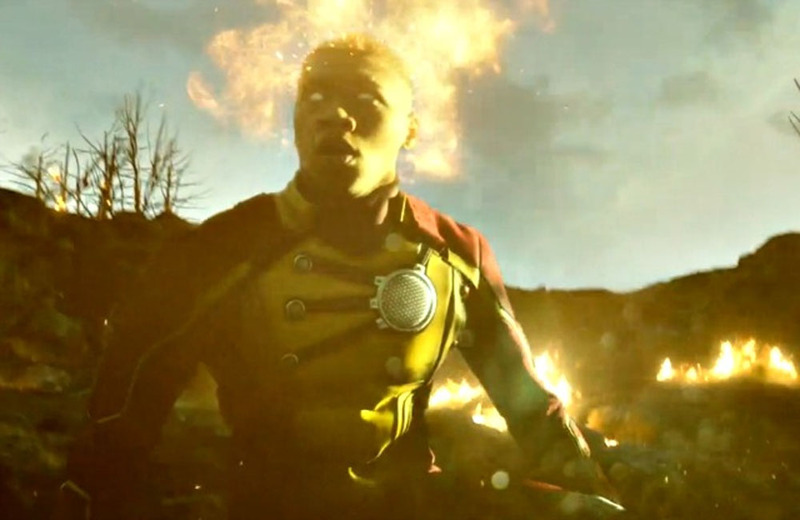 Thankfully, Jefferson and Stein have merged and Firestorm is able to get the bomb away and absorb the energy from it. Meanwhile, during the fight, Ray loses a piece of his Atom suit and this is where a whole new threat is introduced. When the team returns to the Wave Rider, Hunter reveals that Savage has recovered the missing piece of Ray’s tech. Hunter reveals that the tech will be reversed engineered and used as a weapon to destroy Central City in the future. Hunter says that if the team can find the tech before Savage’s people can figure out how it works, this future disaster can be prevented. Before Stein’s group departs, Hunter tries to warn him about the dangers of interacting with a younger version of himself. Stein blows Hunter off and charges off to find his younger self at Ivy Town University. When he, Sara and Jackson do find Marty Stein (Graeme McComb), they see he is brash, full of himself and a bit of a tool. So, twenty-five-year-old Marty Stein is pretty much like sixty-five-year-old Martin Stein, except Marty also likes to get stoned. After some flirting between Marty and Sara, which makes the Professor uncomfortable beyond words, Stein is able to find the tracker his younger version built, but in the process of obtaining it, Marty has to be knocked out. This terrifies Professor Stein as it just so happens that this is the same day when he met his future wife at a college mixer which is happening that night. As fate would have it, by playing with time, Stein returns to the Wave Rider after he and the others track down Ray’s missing tech and finds his wedding ring vanished from his finger and his younger version having followed him and the others back to the ship. Meanwhile, Ray and the Rogues locate the home of the dagger’s owner, Sacha Minkoski, and Ray learns Breaking and Entry 101 from Snart and Rory. He also finds out that the Rogues volunteered for this assignment so they could rob this collector’s home. After finding the dagger, Rory goes off to look for a safe as Palmer confronts Snart. As they fight, they trip an alarm that springs a cage that traps them both. 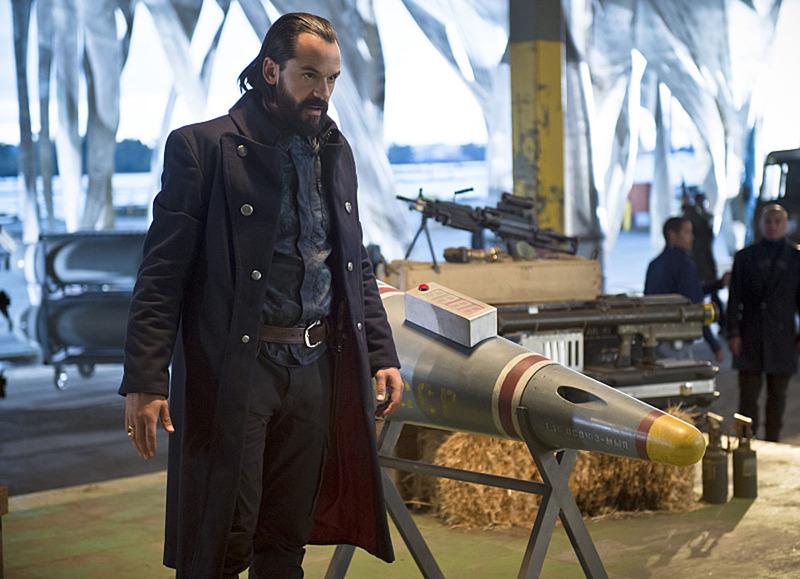 When Rory goes off to find a means to get them out, he runs into Sacha Minkoski, which is an alias for Vandal Savage. Savage, delighted to get another crack at the group that disrupted his sale, demands that his captives call the rest of the team. As Sara watches over Marty, Stein goes off, angry at himself because he sees that the arrogant jerk that Marty Stein is in 1975 is not so different from the arrogant that almost got everyone killed at the weapons black market. Jackson talks to Stein and tells him not to be so hard on himself. “Yeah, you’re arrogant,” he tells Stein. “But you’re also smart and kind and selfless. You want to make the world a better place and you’re willing to risk everything to make that happen.” Indicating Marty, Jackson tells Stein that the young man is not a bad guy and neither is he. Jackson leads Marty off the ship after Professor Stein wishes his younger self a happy life and leaves him wondering just who this mystery man was that he met on this evening. 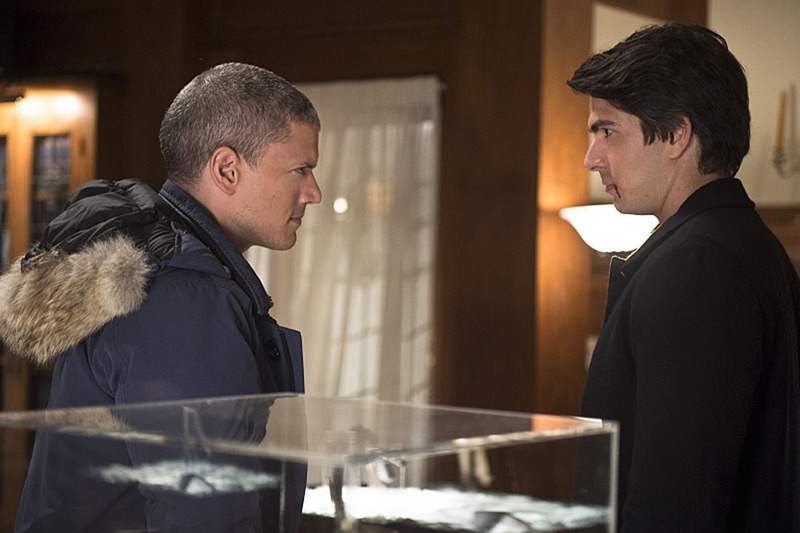 After Marty is gone, Hunter gets the call from Snart about Savage and the team races off to confront him. At Savage’s home, Ray and the Rogues are rescued by Firestorm and as the rest of the team face off with Savage’s hired security, Hawkman and Hawkgirl go off to find the big bad himself. Armed with the dagger, Carter attacks Savage and he manages to plunge it into his foe after reciting the poem. To his horror, Carter finds that Savage doesn’t die. He taunts Hawkman and tells him that since this was his lover’s blade, it must be her hand that wields if they wish to kill him with it. Savage then takes the dagger and kills Hawkman, taking his strength as the Winged Wonder dies. Savage stabs Kendra, but is stop by Ray before he can strike the killing blow. The team gets Kendra back to the ship and Gideon is able to stabilize her. Kendra is sedated as she tells Hunter that she finally remembered how she felt about Carter, the love they shared, and she is torn apart that she didn’t tell him before he was killed. Because a time jump could be dangerous for Hawkgirl at this time, Hunter decides to stay put in 1975 for the time being. Hunter takes Professor Stein in tow and shows him that he has corrected the timeline. He contacted Marty and encouraged him to attend his mixer. The two of them observe Marty with the younger Clarissa, Stein’s wife, as they kiss for the first time. Stein thanks Hunter for risking the timeline for him. Hunter tells him, “One thing time travel teaches you is that time changes, people don’t.” Stein agrees, indicating himself. Hunter tells him that we are here to learn, and he encourages Stein to be thankful he still can. Back at the Wave Rider, Hunter finds the team more determined than ever to stop Savage, if for no other reason than to avenge Carter’s death. With that, the pilot ends with the whole of DC’s Universe, past, present and future ahead of the Legends. Lots and lots happening in this episode and most of it really great. I think the thing I loved most about this one was Victor Garber’s performance throughout. From his too smart for his own good crazy act at the black market meeting to his hilariously uncomfortable reaction to Sara flirting with his younger self to the bonding moment with Jefferson as he takes himself to task for being arrogant to his final scene with Hunter at the college as the Time Master sets his timeline right, Garber is just pitch perfect. I also enjoyed the scene between Wentworth Miller and Bradon Routh as they try and escape Savage’s trap. From calling Palmer “Raymond” to busting his chops for making rookie mistakes to calling Ray a doofus to his face for building his super suit to save the world, Miller takes the material with Routh and runs with it. These two are such opposites, the optimist who wants to make the world a better place and the opportunist who is out to get what he can. Ray is such a good, decent guy, I do have to wonder at the comment Snart makes to him: “[Thinking like mine] makes me a survivor. And there’s gonna come a day when you wish you were too.” Sounds like foreshadowing to me. The WTH!? moment certainly goes to Savage killing Hawkman at the end of the hour. Granted, if you’re going to kill someone, pick one of the two characters that can reincarnate. Still, it was unexpected, and yet it was the action that was needed to bring the team together at last and cement their mission ahead. I know Falk Hentschel will be back, no doubt as Hawkman in one of his previous lives, and it will be interesting to see how the producers play with this. A more minor WTH!? moment comes as Damian Darhk puts in a brief appearance. The fact that the H.I.V.E. operative hasn’t aged in forty years indicates just how powerful he really is. It’s a nice touch by the producers to crossover one of their other shows and stress the shared universe they all inhabit. As I said before, the episode ends with the whole of the DC Universe ahead of the Legends. Indeed, I am excited to hear that the show will be featuring appearances by such characters as Jonah Hex, Sgt. Rock, Ma Hunkel and the Golden Age Sandman. It sounds like the show is shaping up to be just the showcase the DC Universe needs to show viewers just how great it really is. Based on that alone, this episode deserves a solid 4. Dan Johnson is a North Carolina based writer. At this time, he is an assistant editor and writer for Charlton Neo Comics and the editor and head writer for Empire Comics Lab’s horror anthology, Cemetery Plots. Dan has also worked for Antarctic Press, Campfire Graphic Novels and the Dennis the Menace comic strip. Besides his work in the comics industry, he has also written for Alter Ego, Back Issue, Comic Book Marketplace, Filmfax, Hogan's Alley, Monster Memories, Monster News and Scary Monsters Magazine.